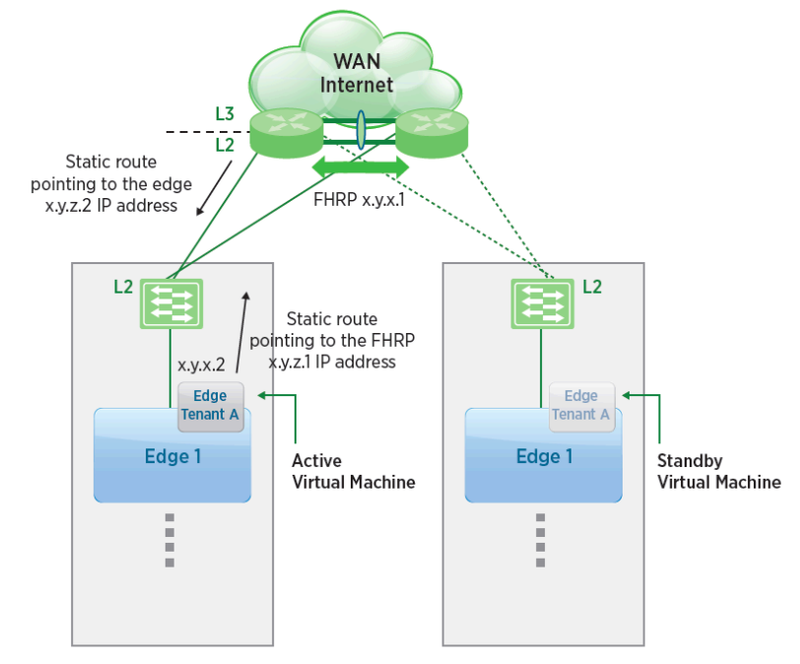 Before I jump into the HA commands, let me briefly preface with a few words about NSX Edge Services Gateway High Availability (simply HA going forward). You will need to understand the heartbeat path and what type of infrastructure-impacting health events are common to your infrastructure. You may find yourself troubleshooting High Availability many times because of a change or degradation in the underlying Hosts, Storage or Network. Be careful with those red herrings. When HA is implemented with a solid understanding of the underlying infrastructure and its variations, you can enjoy peace of mind in knowing the edge network services are highly available. – It uses an Active/Standby topology. – When HA is enabled, a second VM is deployed. The new VM will only be networked to communicate with the primary. – When HA is disabled, the 2nd VM is destroyed. – HA appliances will be deployed based on the user-defined mappings (at these these settings are not dynamic). – Changes appliance settings will trigger an OVF re-deployment of the edge. – Optional. If not configured, NSX will assign a valid /30 IP pair using an RFC3927 network. – If configured manually, valid subnets are system enforced. 10.0.0.0/30 and 10.0.0.1/30 is not valid. 10.0.0.1/30 and 10.0.0.2/30 is valid. – Optional, it can be left to ANY. – A minimum of one edge interface is required before enabling HA. – The recommendation for maximum availability is to configure a network dedicated to the vNIC heartbeating. – Sharing a vNIC will work without problems as long as the network is not overloaded and available. – The current recommended deadtime is 15 seconds (uses a 3 second polling frequency). There is a tradeoff of service failover time for increased resiliency to lost heartbeats. – Host anti-affinity is handled by system. When HA is enabled there is a cluster DRS rule added automatically with the name anti-affinity-rule-edge-#, where edge=# is the edge-ID. – Storage anti-affinity is not handled by default. For maximum availability of the edge pair, configure the edge appliances to deploy to different physical storage resources. Especially important in infrastructure that uses centralized storage. – Open your (vCenter Log Insight ), Splunk or log aggregation solution of choice. – Build aview of all edge logging (use regex or glob based matches to filter according to your naming convention). – Examine matches on the text “lost packet”. Build an alerting rule based on your results. – When the infrastructure is healthy, there should be not be any HA packets lost. – Examine matches on the text “Late heartbeat”. Build an alerting rule based on your results. – Late heartbeats may indicate infrastructure problems. Possible resource constraints or both edges in the HA pair. – This can also result in a split brain state. Lost and late heartbeats are the early indicators. Early indicators are your best friends. Keep a close eye out for these. – Filter logging based on NSX Manager SystemEvent, you can use the text [SystemEvent] to filter. – Any single event source with more than one or two events should raise a red flag. Any unplanned switchover events should be researched. Build an alerting rule based on your findings. – Matches on these can indicate that the state of HA has most likely entered the split brain state. Network Services will be mostly unavailable until the condition is resolved. – Hopefully these do not exist in your environment. Build a preventive alerting rule. Matches are immediately actionable. That is all folks. Hope this helps. Anyone using NSX SSL VPN-Plus feature for more than one site will quickly find there is no mechanism for importing client configurations. The native method for accessing additional sites is to browse to the Gateway for each site (then download and run the installer). That’s pretty tedious as your site count increases. There is a better, albeit unsupported, way to manage this need. In windows, client configuration is stored in the registry. You can manipulate the windows registry using .reg files. Save the file as a .reg file, the name of the file is arbitrary. Navigate to HKLM\SOFTWARE\VMware, Inc.\SSL VPN-Plus Client and verify the connections were imported. Update the ConnectionCount to the total number of sites. This is important; if the number doesn’t match, naclient will not start. That is all peeps. Have a nice day. Message:     do_state_transition: All 2 cluster nodes are eligible to run resources. Message:     crm_timer_popped: PEngine Recheck Timer (I_PE_CALC) just popped! 30033 Major VShield Edge VM not responding to health check. 30034 Informational None of the VShield Edge VMs found in serving state. There is a possibility of network disruption. 30042 Informational vShield Edge VM has recovered and now responding to health check. 30202 High vShield Edge HighAvailability switch over happened. VM has moved to ACTIVE state. 30203 High vShield Edge HighAvailability switch over happened. VM has moved to STANDBY state. The NSX walkthrough is the perfected balance the brevity of a presentation slide-deck with involved hands-on demonstrations. Very well put together (Check out some of the other walkthroughs). The design guide is a PDF~30 pages is a gentle introduction to NSX topologies. Fundamental read if you’re still trying to get a handle on NSX concepts. Subject matter content from the experts. Posts by Martin Casado, Bruce Davie, Brad Hedlund, Roger Fortier. Get acquainted with NSX Dynamic Routing, the Distributed Firewall & Load Balancing. Nothing fancy about this one… ’tis the manuals. NSX Install and Upgrade Guide & NSX Administration Guide. Although in the public domain, this resource is extremely difficult (if not impossible) to find via search. But they are in the public domain. Whatever is public is not private…right? 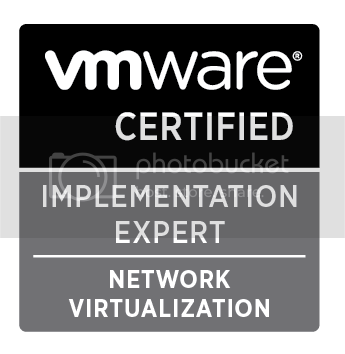 This should at the very least provide a fair start for anyone looking to mentally ramp up for the NSX NVP.